All ingredients and equipment included - and lunch too! There's nothing like the smell and taste of bread you've made yourself. 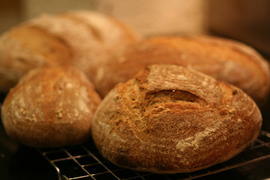 Give the gift of learning how to make wonderful bread on this one day hands-on course. The day will cover all the essentials of breadmaking from equipment to ingredients and technique. The lucky recipient of the gift will be rolling their sleeves up and making all the loaves themselves, and hopefully there will be plenty to take home and share with the generous person who gave them the gift! This course is suitable for beginners.